Of the many downfalls and doofus moves this team has made under Jimmy, this has to be tops. Paying that kind of money to an aging star. It's unprecedented as well. As we can see, the return on investment just isn't there. I'm wondering how the 20 year thing will pay dividends if that's their plan. And it's starting to look less and less like there was any plan in mind, other than being able to say they had a 20 year player. They certainly paid a steep price for the privilege. Were still talking about this? Time for less negativity and more positivity. Lets just focus on our young guys. You would think by now ESPN would come up with something else to talk about. That contract is old old old news and is about to play out. When did you start believing ESPN? Sometimes these news outlets just write something to stir up conversation and controversy so ppl talk about them. Agree, just a way to stir things up. 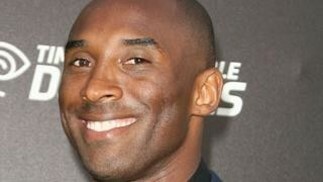 But I do hope Kobe doesn't come out in prove them wrong mode, and start jacking shots up left and right. Hope he sticks with his preseason comments and plays off Russell or whoever is at pg. Time to help youngsters develop. I don't understand why people get upset about it, Kobe has not been healthy, has been poor statistically the past 2 seasons when he has played and he is 37 years old. The NBA and sports in general are a younger man's game. Kobe is not the player he was, and there is nothing wrong with that, all the greats fade away as they get older, no one beats father time. It is not Kobe hating it is seeing things as they are and not through rose tinted glasses. You're right, nobody beats father time, but even at 37, I'd still take Kobe over some of those players ranked right ahead of him. 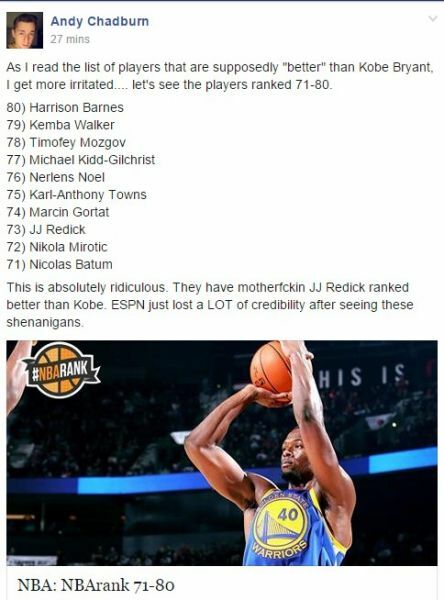 Let's see... Jahlil Okafor and Karl Towns are ranked higher than Kobe. Luol freakin Deng is rated higher than Kobe.... a lot of these types of players are absolutely ridiculous to be ranked higher than Kobe. If Kobe keeps playing the way he is in the pre-season then he'll be back to top 15-20 player by all-star break. Until then, not much else we can do about the rankings now. Post I made on a Laker's Facebook page. My thoughts on the players they put ahead of Kobe. I have no further comments.. This would be great for April fool's. To bad it ain't April.....lol & smh both at the same dam time. As I pointed out above, Kobe has played pretty bad. But just like the video game thread are you going to refuse to explain why he should be ranked higher? Or is this just your opinion again. I'm with you. Funny as hell. The ranking wasn't who's best. It was who would have the biggest impact on their team, W's vs L's. I'm no way a Kobe hater, quite the opposite. I am however a Jim Buss hater. And this is one of those insane things we will no doubt talk about for a long time, and should. This is something we should never forget. The impact it has had and will continue to have on this team is immeasurable. Half of NBA Teams Losing Money...Seattle Expansion? Don't Blow Your Money on the Mayweather-McGregor Fraud. Lakers Ranked 12th - Say It Isn't So.